Preventive health care allows your cat to have a longer, more comfortable life. It won't happen if you can't get your cat out of the house. Most cat appointments are cancelled because the cat can not be put into a carrier. Cats are uncomfortable with the unknown and the unfamiliar, for example, a trip to the vet, in the car. We always recommend transporting your cats in a carrier, outside the house. We consider this extremely important. One client described how their kitten crawled UNDER THE BRAKE PEDAL when driving to Advanced Care. Consider that for a minute. We've heard a story or two about cats peeing down into heating vents. All pets including cats, allowed to roam freely inside the car face the risk of more severe injury should there be an accident. If your kitten crawls under the brake pedal, it may cause the very accident that hurts it. 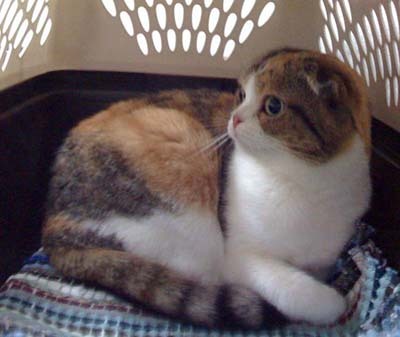 Cats are often startled by loud noises or other pets, and, if you are carrying your cat to the vet in your hands, you might not be able to hold on if it abruptly tries to get away. You will likely receive some bloody scratches. Getting Your Cat to the Veterinarian a helpful Cat Care PDF brochure with cat travel tips and ideas. A Feline Friendly Veterinarian, Recommended by Cat Owners for: caring service, sound advice and no pressure. VIDEO: What's A Good Cat Carrier? The Catalyst Council video here gives some useful insight for carrier selection and encouraging your cat to become more comfortable with it. Choose a hard-plastic carrier with removable top. Some cats resist being put into a carrier, but removable tops allow you to lower the cat into the unit reducing stress for you and the cat. Simply undo the screws or latches, lift off the top, set the cat in the bottom, and replace the top. This eliminates the need to force the cat inside, which makes the cat and you more relaxed. Many cats get stressed when it’s time for a veterinary visit. Thankfully, there are ways to help cats relax and enjoy the ride—yes, even in the car. Here’s what you can do. Lay a few treats inside the carrier from time to time. You can help your cat become for familiar with the unknown by taking your cat out for a few trips from time to time. Try a few stress-free trial runs. Call us to ask if the schedule would allow you and your cat to stop in for five or 10 minutes. You don't have to make it a medical visit, rather a simple hello that allows your cat to experience all the steps of a routine visit without an exam. A free “happy visit” gives your cat the chance to get used to the drive here, the sounds and smells of the clinic, a chance to meet the folks here, and enjoy a few treats. After the visit, you and your cat head home. If a car ride alone puts your cat in a tailspin, entice your cat into its carrier and start by going for a test drive around the block. Continue to take a drive every now and then, gradually increasing the amount of time you and your cat spend in the car. Remember to reward your cat with a treat for being a good passenger. Eventually, you’ll work your way up to doing a drive that will allow you and your cat to make a “happy visit.” Positive reinforcement is the best way to modify feline behavior, so making car rides and veterinary visits pleasant will help decrease your cat’s anxiety.